A recent discovery about the evolutionary origins of bats relates, at least indirectly, to a problem causing the extinction of many bat species throughout North America. As they reported in the Proceedings of the National Academy of Sciences, Ya-Ping Zhang of the Kunming Institute of Zoology and colleagues have found evidence that mitochondrial genes in bats, which are responsible for their metabolic use of energy, have been under heavy selection pressure since early in their evolutionary history. Such a conclusion makes considerable sense on its face because bats’ way of life is highly energy intensive. 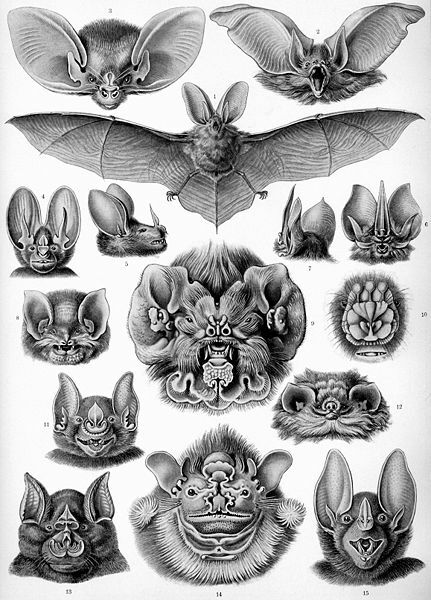 Nevertheless, the finding also helps to sketch in some of the mysteries of the evolution of bats. Bats are hard to look at in fossil record because they don’t fossilize well; they suddenly appeared in Eocene strata from about 50 million years ago looking fairly much as they do now, which left cryptic some of the steps up to that point. Over the past decade, several discoveries have helped to firm up the view that the ancestors of bats spent their lives leaping and hopping through vegetation before they could fly; that the evolution of their wings seemed associated with key changes in certain genes for digits; that their ability to echolocate seems to have emerged after their capacity for flight; that the larger bats called Megachiroptera are indeed descendants of the smaller Microchiroptera and not the convergently evolved cousins of primates. The place of the metabolic changes in that scheme, though, were largely speculative. The demands on bats’ mitochondria could have emerged only once they started flying, but instead it seems that their ancestors made a living as an extra hyperkinetic group of insectivores leaping through the trees and shrubs. All that energy expenditure comes at some cost to the bats, however. Most obviously, they need to eat colossal numbers of insects to satisfy their energy needs. During the cold winter months when insects become more sparse, bat species that don’t migrate to warmer climes must overwinter in caves, suspended in a state of torpor with their metabolisms at a crawl. Unexpectedly, those energy demands may also figure into the catastrophic epidemic of white nose syndrome that has been killing bats in North America in recent years. The bodies of the dead bats studied by researchers have commonly been marked by heavy accumulations of this fungal infection, which in severe cases can damage the overwintering animals' skin and wings, leaving them unfit. Yet the observed level of infection and the timing of the bats' deaths suggest that this obvious explanation isn't adequate: in many cases, the fungus should have been only about enough to pose an itchy nuisance, maybe akin to aggressive athlete’s foot in humans. That benign comparison may break down when applied to bats in torpor, however. Bats going into hibernation carry stockpiles of fat to sustain them, but those stockpiles are often just sufficient to get them through the winter season. Moreover, the bats do not consume those fat reserves at a consistently slow pace: every two or three weeks throughout their hibernation, the bats wake out of torpor, excrete, groom themselves, settle into genuine sleep for a while, then slow down their metabolisms again. These periods of activity seem to be essential to hibernating mammals, perhaps because they help to reinvigorate their immune systems. Eighty percent or more of the energy that the bats consume during their hibernation is spent during these brief intervals. One theory therefore being investigated by researchers such as Craig Willis at the University of Winnipeg is that the fungus makes the animals rouse from torpor more often to groom themselves, and in the process makes them burn through their crucial fat reserves too quickly. Long before winter is over and insects are plentiful again, the bats starve. North American bat species may be more vulnerable to white nose fungus than their European counterparts are because they roost in far larger colonies and so may transmit the fungus more widely throughout their population. It’s entirely possible, however, that the smaller European colonies are in fact an evolutionary consequence of white nose fungus (or some equivalent affliction) selecting against larger gatherings in the distant past. This is only my own speculation, but if a highly amped metabolism has long been an adaptive feature of bats and their immediate ancestors, then perhaps for as long as these creatures have been using torpor to survive the cold months, something like white nose fungus has been cropping back colony sizes periodically. Unfortunately, given the difficulty of finding good bat fossils, verifying such a hypothesis may never really be feasible. But who’s to say what other deductions might yet be possible from the DNA record?